Being a mom means you’re constantly on the go! Whether you’re going to work, taking your kids to daycare or to after school activities, it seems like there’s never really time to do anything. However, just because you’re a busy mom doesn’t mean you have to go out without putting your best face forward. When it comes to going out with your kids, your spouse or even yourself, it’s great to go out looking well-groomed and put together. It’s as simple as throwing on a little mascara, your favorite lip product, and if you need it, something to even your skin tone. The thing to keep in mind is to keep it simple and prioritization is key. By prioritization, I mean focus on the things you want to enhance, whether it’s your eyes, lips, brows, great complexion or cheekbones. I know that when you’re a mom everything you do has to be efficient and consumes as little time as possible. Overtime, with much practice with mini me in the bathroom with me while I apply my makeup, I’ve been able to simplify my routine, and get it down to under 10-minutes. 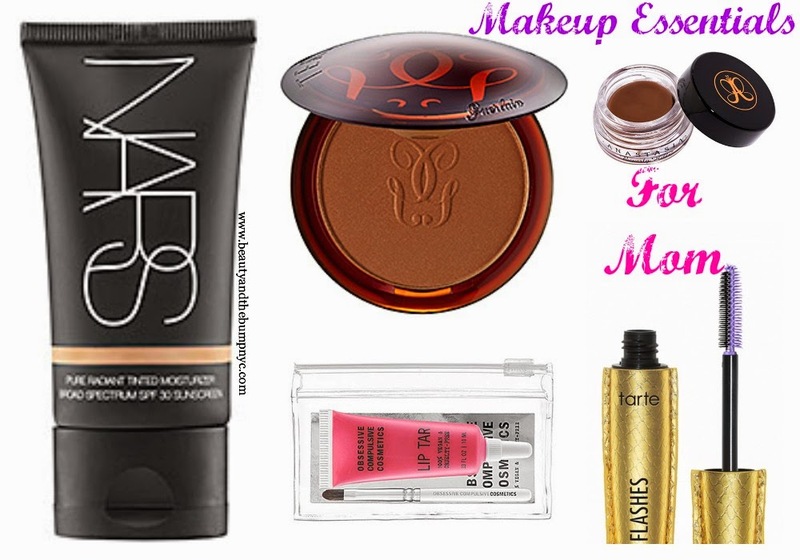 Below are some of the makeup essentials I use and suggest for any busy mom to stay sane and look great! Tinted Moisturizer helps even your skin tone by hiding your blemishes without it looking too heavy. They’re also perfect for wear when the weather heats up. BB creams are similar to tinted moisturizers, but they also treat your skin. My favorite tinted moisturizers are: NARS Pure Radiant Tinted Moisturizer, Laura Mercier Oil-Free Tinted Moisturizer, and OCC Tint. My favorite BB Creams are Maybelline Dream Fresh BB, Garnier Miracle Skin Perfector BB Cream, and AJ Crimson’s BB Cream. If you ever have to leave your house, and you have one minute to put on anything, choose grooming your eyebrows. Nothing makes your face, in my opinion, look more polished than a well-groomed eyebrow. My favorite products are: Anastasia Beverly Hills Dip Brow, Make Up For Ever Brow Pencil, and MAC Brow Pencil in Spiked. I use a MAC Brow gel or Model in a Bottle Brow Sealer to set my brows to last throughout the day. Mascara takes only seconds to apply and can enhance your look almost instantly. For a minimalist look brown works best, but I do love black mascara’s the most. My favorite mascaras are: Dior Show Mascara, tarte Lights Camera Flashes Mascara, and Maybelline Great Lash Mascara. The perfect lipstick or gloss can make you go from a drab mom or glam mom. Whenever I wear lipstick without having a full-face of makeup I choose a high-impact shade that speaks for itself, which is either my favorite reds, fuchsia or orange.